Really, what me, ‘Laugh out loud funny’? That’s one of the nicest things anyone has ever said about my writing, second only to what my fellow finalist Kylie said here (check it out to see her list of the lovely blogs I was up against). I have to admit I blubbed AGAIN – my only excuse being it was such a surprise and I was just soooooooooo shocked. So I’d like to do a ‘proper’ acceptance speech now if you don’t mind …. Thank you so much for this award, it means so much for me to be in this category with such amazing blogs. I love writing, and I love my readers, because without them I wouldn’t enjoy it as much. The reason I write my blog is because I think that Mums are incredibly important in our world as we are where everything starts; so we deserve to enjoy ourselves and we deserve help to enjoy ourselves. Big thank you to the Britmums team for their amazing organisation as always, and to Kids One Stop Shop for sponsoring this category and Carla Buzasi for being the judge (must have been a really tough job). What Was BritMums Live Like? The thing about conferences like this is I come away with tonnes and also feeling like I missed out on tonnes. It was a little tricky because I had Little Dimples with me, as she still breastfeeds at lunch and lots in the evening and I’m a rubbish expresser. Nanny Bets (the little old irish lady I found in Tescos) came to help, and thoroughly enjoyed her day wandering around the hub and holding babies in the quiet room. From it I could have learnt stuff, met people, and connected to brands, and I’ve come away feeling like I could have done loads more of all three. To be honest I was distracted by being on the panel for a discussion den on online negativity, having Little Dimples there, and by being a little ‘rabbit in the headlights’ when faced by 500 bloggers, so I’m not sure my strategy to get the most out of it actually existed. I got to put some faces to twitter ids, and even had a couple of ‘proper’ chats with a few bloggers; BUT there are so many I missed too *sad face*, and some people said they were too nervous to come up and say hi to me. So I’m telling you all now – ALWAYS come up and say hi to me! I probably missed lots because I was coming in and out by train, so I didn’t see Ruby Wax, Sarah Brown or the Keynotes. But I enjoyed the awards ceremony, thought Katy Hill did a brilliant job, and loved Cherry Healy’s talk at the end of Saturday. Katy insisted that even celebs have cellulite; which makes her fabulous in my eyes! Cherry really underlined how important bloggers are to PR’s and Celebs now a days and I came away with a clearer understanding of how we fit into the bigger picture. I think it’s a bit difficult to span all experience levels, so a couple of the workshop/panels left me a bit frustrated, but I really enjoyed the Youtube one with Christine Beardsell. I think that Mum/Parent blogs can be a bit dry, and was disappointed I didn’t get more from the ‘clever parent bloggers’ session on how to avoid this, but Christine’s session inspired me with ways that I could use Youtube as a funny extension of my blog (I already have a Mummy Whisperer channel); but I’m not giving away my ideas yet, as Cherry told us not to! Paul from Viapoint (a new hero who I was really looking forward to meeting because he’s learnt loads about the psychology behind online behaviour). I made a contact in Google who will hopefully resolve my Google-Youtube problem, thus making the whole thing worth going to. But I must admit I didn’t put much effort into getting swag or making brand connections, which maybe I should have focussed on a bit. However, I did still get loads of swag, and because of winning and being in a panel I have some duplicates, so see below for your opportunity to get some swag too! – I know you had a butterflies section, but it would be great to have a list of names of who is going, so that I could have been more organised about who I got to see (obviously some people might not want to be openly on the list, which is fine). OOOOH and make them add pictures you can actually recognise people from! – It would be great if you could mark sessions as beginning, experienced or advanced to help us choose. – Could we have a place marked as ‘I’d like to meet other bloggers’ area, for when we are too tired for brands or learning and fancy a chat? – I know you gave us great maps and agendas, but I’m rubbish with them; could we have HUMUNGOUS signs please saying things like ‘Warner Bros’ (missed them until Sat afternoon! ), ‘Meet bloggers here’, the room names, and marking the quiet baby room (a few bloggers with babies missed it). – I loved the tea, cake, Prosecco, Saturday lunch, and half naked waiters! The little snacky things on Friday evening were a bit posh for me though. Your organisation is really slick, and I know that each year it’s going to get better and better. – Take tissues if there is any chance of me blubbing! – Don’t share trifle with a 2yo – they eat it all! How Did My OutFit Work Out? A huge thank you again to Joe Browns who provided my clothes for the conference. Apart from the fact that I now have several outfits (mix and match you know!) to wear all the time now, it made a big difference to how confident I felt. (Check out my post beforehand on what to wear to a blogging conference, which explains how come I was lucky enough to get in contact with them). Loads of people said they liked the clothes, and I felt comfortable, but still pretty. They also handled the freaky weather, which was cold one minute and hot the next. Bit thankyou’s to New mum online and Mums gone to for the photo’s! But because I won and was a panelist I have some duplicates, so I thought I’d give all those people who didn’t attend a chance to WIN SOME SWAG? What you’d like to see me write more about. The competition will end next Wednesday 4th July 2012 at midnight and is only open to the UK and Ireland (sorry postage costs!). You can get extra entries by following me on twitter and my Facebook page. Have you thought of going to a Family Festival this summer? Such a well written comprehensive post. Really enjoyed it. Was also refreshingly honest. My pleasure with regards to the photos. Thank you for your free one-to-one after the Discussion Den – it was invaluable to me. You are the first “Life Coach” I have ever met who is a natural at it. Born to it! Thanks for the feedback Your session was fab! 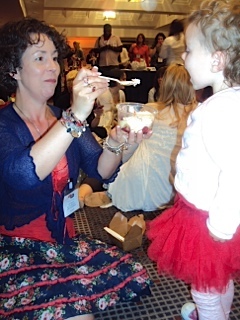 Enjoyed having strawberry trifle with Willow too. Apart from the Discussion Den/Bloggers’ Studio we marked most sessions as Beginner or Advanced to help people choose. We weren’t sure how to mark discussion dens though. Looking forward to next year already. Pretty accurate review, I’d say. I agree about the ‘I’d like to meet….’area – that would be difficult to manage (?) but a really great thing to have – I found I didn’t know who I was looking form, but could name the bloggers I wanted to meet. Tricky. I LOVE your list of suggestions for next year – I especially loved the idea of a list of names and photos!!! I too could have done with better signage, and a “would like to meet other bloggers without the brands” would have been useful. Sorry we didn’t meet – maybe next year! Definitely @Janmary – just check for my photo on their new ‘blogger board’ and we’ll find each other! It was a pleasure to be on the same panel as you, Lisa – not only are you a lovely person who clearly inspires huge affection amongst other bloggers, but you know your stuff (I thought the summary slide was great, and really helpful)AND you’re an award winner – woot woot!! Thank you gorgeous @Di – I’m a huge fan of the powder room! I’m so glad you won! And really glad you did a Gwyneth Paltrow! But I’m also glad you wrote this. I didn’t take a single photo, which was really stupid. *Sighs* Will just have to go back next year and do it all again. @actuallymummy so glad I’m not the only one who forgot to take photos – have so changed my attitude now – I’m going to be the queen of photos at the festival I’m going to this weekend! Hello den chum – It was awesome to meet you!! And to share the debate floor with you. You are indeed an amazing bloggess. Great summary post and thanks for the linky. I banged mine out very quickly so was less linky efficient ;( soz!! I had some great feedback from our session which was that it was very useful – so glad to be able to help. Himself has gone so let’s get that Shire visit booked in! @Amodernmilitarymother right – on that diary planning now! Congratulations again! I’m so happy for you, but as the others said, it was well deserved. Such a shame that I didn’t go to BritMums this year, but it’s definitely on the agenda for next year. But for now I’ll try and win a nice swag bag 😉 Being slimy and telling you what you want to hear is not my thing, but I’d love to point out my favourite post, which was “Does it help to know I struggle too?”. Obviously not because you do struggle, but because it was an honest post, written from the heart and showing other mums that they are not alone. Thanks @Carolin, it’s lovely to hear that people liked that post, because I did get an instantaneous unsubscribe lol! oooh thank you @ruthy I always worried that those money saving tips were a bit dry, so it’s lovely to hear you liked it thank you. I like the Problem corner and the section on school. Really interesting to read about the Family Festivals, it is definitely on our to do list this summer. I’m enjoying being a mummy more amd more and i love reading blogs for finding out what’s out there for families. @olivia thank you so much for your comment, it’s great to hear that people like the problem corner and that you are going to try out family festivals. Well done you for enjoying being a mum more and more – that’s what it’s all about! Sorry that I missed a chance to catch up. Am really not sure what I like best here, I suppose I most often pop over from twitter rather than reading regularly. @Katrina congratulations on winning BTW – and really interesting to hear that you like the reviews as many bloggers are worried about having too many of them on a blog!